"F1 2015" redirects here. For the video game based on the 2015 Formula One season, see F1 2015 (video game). The 2015 FIA Formula One World Championship was the 69th season of FIA Formula One motor racing. It featured the 2015 Formula One World Championship, a motor racing championship for Formula One cars, recognised by the sport's governing body, the Fédération Internationale de l'Automobile (FIA), as the highest class of competition for open-wheel racing cars. Twenty-two drivers representing ten teams contested nineteen Grands Prix, starting in Australia on 15 March and ending in Abu Dhabi on 29 November as they competed for the World Drivers' and World Constructors' championships. Lewis Hamilton was the defending Drivers' Champion after securing his second title at the 2014 Abu Dhabi Grand Prix. His team, Mercedes, began the season as the defending Constructors' Champion, having clinched its first championship title at the 2014 Russian Grand Prix. The calendar featured two significant changes from the 2014 season. The first was the return of the Mexican Grand Prix, held for the first time since 1992. The other change was the cancellation of the German Grand Prix after a venue could not be agreed upon, leaving the nation without a World Championship event for the first time in fifty-five years. Hamilton secured his third Drivers' Championship with three races left in the season. The runner-up was his teammate Nico Rosberg, 59 points behind, with Ferrari's Sebastian Vettel third, another 44 points adrift. Mercedes AMG Petronas F1 Team clinched the 2015 Constructors' Championship at the Russian Grand Prix, ahead of Ferrari and Williams, and ended the season with a record 703 points. Hamilton also won the FIA Pole Trophy with a total of 11 pole positions in the season and the DHL Fastest Lap Award. Ferrari won the inaugural DHL Fastest Pit Stop Award. The following teams and drivers took part in the 2015 Formula One World Championship. Teams competed with tyres supplied by Pirelli. Several team changes took place before the season began. Both McLaren and Lotus changed engine suppliers for the 2015 season. McLaren ended their 20-year partnership with Mercedes-Benz, in favour of a return to Honda, who had previously supplied them from 1988 until 1992. Honda had been absent for seven years: they had provided British American Racing and Jordan Grand Prix with engines until they purchased the former in 2006 and then had competed as a constructor until 2008. Lotus ended its association with Renault in favour of a deal with Mercedes. This ended a 20-year involvement of Renault with the Enstone-based team, (which operated as Benetton from 1992 until 2001, as Renault from 2002 until 2011 and as Lotus from 2012 until 2015) after being an engine supplier to Benetton since 1995, and being the owner of the team from 2002 to 2010. Both Caterham F1 and Marussia went into administration towards the end of the 2014 season. The latter was saved narrowly from liquidation in February 2015, re-entering as Manor Marussia, when new investment was secured and the team left administration after an agreement with creditors was reached. Caterham ultimately folded and its assets were auctioned off by company administrators after the start of the season. Sebastian Vettel left Red Bull Racing – the team with which he won four World Drivers' Championships – at the end of the 2014 season to join Ferrari. The driver line-ups saw a couple of changes prior to the 2015 season and one more prior to the Singapore Grand Prix. Fernando Alonso replaced Kevin Magnussen at McLaren, returning to the team after he last raced for them in 2007. Following an accident during pre-season testing, Alonso withdrew from the season-opening Australian Grand Prix, and Magnussen returned as his temporary replacement. Sebastian Vettel left Red Bull Racing at the end of the 2014 season after five years with the team and nine years with its wider junior development programme to join Ferrari in place of Alonso. Daniil Kvyat was promoted to Red Bull from Toro Rosso to fill the vacated seat. Toro Rosso changed their entire line-up: along with Kvyat joining Red Bull, the team chose not to renew Jean-Éric Vergne's contract. Vergne went on to compete in the Formula E Championship while also becoming a Ferrari development driver. They were replaced by the 2014 Formula Renault 3.5 Series champion Carlos Sainz Jr. and the 2014 FIA Formula 3 European Championship third-place finisher Max Verstappen. The latter became the youngest driver to make a Formula One début, at the age of 17 years, 164 days when he started the season. Esteban Gutiérrez and Adrian Sutil were released from Sauber, where they were replaced by the former Caterham driver Marcus Ericsson and the GP2 driver Felipe Nasr. Gutiérrez and Sutil went on to join Ferrari and Williams respectively as reserve drivers. Manor Marussia also had two new drivers: They employed the former Caterham driver Will Stevens to drive for his first full season in the sport, while another former Caterham test driver, Roberto Merhi, was signed to a short-term deal while he also drove in the Formula Renault 3.5 Series. Max Chilton relinquished his seat, joining the Indy Lights championship, while Jules Bianchi was in a coma at the start of the season and ultimately died from injuries sustained at the 2014 Japanese Grand Prix. Alexander Rossi was later drafted in by Manor Marussia to make his Formula One début at the Singapore Grand Prix, replacing Merhi. The Spaniard returned to the team for the Russian and Abu Dhabi Grands Prix, sharing the car with Rossi for the remainder of the season. Kamui Kobayashi went on to race in the Super Formula series in Japan after the folding of Caterham left him without a drive in Formula One. 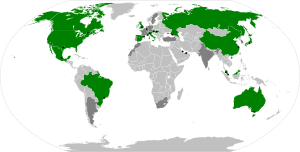 Nations that hosted a Grand Prix in 2015 are highlighted in green, with circuit locations marked with black dots. Former host nations are shown in dark grey, and former host circuits are marked with white dots. Comparison between the configuration of the Autódromo Hermanos Rodríguez last used by Formula One in 1992 (top), and the redeveloped layout used from 2015 (bottom). There were a few revisions to the calendar from the previous season. The Mexican Grand Prix returned to the Formula One calendar for the first time since 1992. 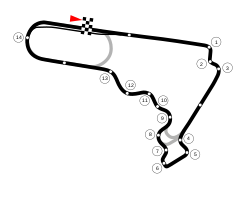 The race was held at the Autódromo Hermanos Rodríguez circuit located in the centre of Mexico City, which was the location of all Mexican Grands Prix in previous decades. 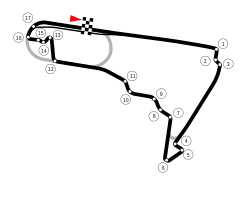 The circuit was substantially reconfigured to accommodate the sport's return. The Grand Prix of America and the Indian Grand Prix were both contracted but did not feature on the calendar. The former originally aimed for a debut in 2013 at the Port Imperial Street Circuit in New Jersey after a 15-year contract was signed, but was delayed for a third straight year, while the latter was cancelled for the second consecutive year due to an unresolved tax case in the Bombay High Court. The German and Korean Grands Prix were both included on the provisional calendar. The former was set to return to the Nürburgring, in accordance with the event-sharing agreement established between the Nürburgring and the Hockenheimring in 2008. The Nürburgring had previously hosted the race in 2013 and so was scheduled to host it again in 2015, but the venue was left off the provisional calendar, leaving the event-sharing agreement at a stalemate. With both venues unwilling to host the event, the race was ultimately cancelled, leaving the country off the Grand Prix calendar for the first time since 1960. The Korean Grand Prix was scheduled to return to the Formula One calendar after being removed in 2014, but the plan was ultimately abandoned. The number of power units that a driver could use in a season was reduced from five in 2014 to four in 2015. This was tweaked after the 2015 British Grand Prix, with new power unit manufacturers being allowed one other power unit in their first season of competition; the only manufacturer affected in the 2015 season was Honda, who were allowed to take advantage of the rule even though it had been introduced after the season had begun. The rules regarding engine development that were introduced for the previous season were changed as well, with the manufacturers allowed to perform half the development permitted in 2014. Following the backlash over "ugly" nose designs in 2014, the FIA moved to amend the rules surrounding nose designs for the 2015 season. Noses were lower than in 2014, retaining a minimum cross section, but they had to taper to a point at a fixed linear rate, effectively outlawing the dramatic finger shapes seen in 2014 in favour of a more gradual shape. Furthermore, the design of the nose had to be symmetrical and consistent with the centreline of the car, thereby banning the more exotic designs, such as the "twin-tusk" approach used by Lotus on the E22 chassis. The minimum weight of the cars at all times during an event was increased to 702 kilograms (1,548 lb), a difference of 10 kilograms (22 lb) from 2014, addressing concerns raised the year before that the lighter weight limit forced taller drivers to become unhealthily slim. The ban on front-and-rear interconnected suspension systems (FRIC) that had been implemented in the middle of the 2014 season was formalised, with the regulations stating that the front and rear suspension had to be designed in such a way that any change in performance had to be a direct result of a change in load applied solely to them. The anti-intrusion panels on both sides of the survival cell were extended upwards to the rim of the cockpit and alongside the driver's head in order to improve the drivers' safety in event of a side impact. Titanium skid blocks on the underside of the car were made mandatory for the 2015 season, which led to a return of sparks being created by the cars as the underbody touched the track. Several rules regarding penalties were changed for the 2015 season. The replacement of a complete power unit, exceeding the maximum number allowed per season, no longer resulted in a penalty in itself. Penalties continued to be applied cumulatively for the replacement of individual components of the power unit, and if such a grid place penalty was imposed and the driver's starting position was such that it could not be applied in full, the remainder of the penalty was no longer carried over to the next race, but was instead applied in the form of a time penalty during the race corresponding to the number of grid spaces remaining in the penalty. This was tweaked after the 2015 British Grand Prix with immediate effect, to make demotion to the back of the grid the maximum penalty for engine changes. Additional time penalties to be served during the race were abandoned. As well as the existing five-second penalty that could be served during a driver's scheduled pit stop, a new ten-second penalty was introduced, to be served in the same manner. If a car was deemed to have been released from a pit stop in an unsafe manner, the driver would receive a ten-second stop-and-go penalty. Further penalties could be applied if the stewards believed that the driver was aware of this and attempted to drive the car regardless. 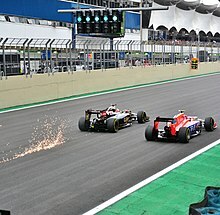 If any team personnel or team equipment remained on the grid after the fifteen-second signal had been shown before the start of the formation lap, the driver of the car concerned would have had to start the race from the pit lane. If the driver concerned failed to obey this, they would have received a ten-second stop-and-go penalty. The rules regarding qualifying and the start times of some races were tweaked. The qualifying procedure was further clarified to cater to different sizes of starting grids: if twenty-four cars were entered for the race, seven would have been eliminated after each of the first two qualifying segments; if twenty-two were entered, six would have been eliminated after each qualifying segment and so on if fewer cars were eligible. In light of a regulation introduced in 2014 dictating that a race could not run for more than four hours and following recommendations from the report into Jules Bianchi's accident the previous season, the start times of five Grands Prix were moved forward by an hour, so that races did not start with less than four hours until dusk. Thus, the Australian, Malaysia, Chinese, Japanese and Russian Grands Prix started an hour earlier than in 2014. There were other changes introduced in a bid to further increase the safety of the sport. In the aftermath of Bianchi's accident, a new procedure called the Virtual Safety Car (VSC) was introduced following trials during the last three Grands Prix of 2014. The procedure could be initiated when double waved yellow flags were needed on any section of a circuit where competitors and officials were in danger, but the circumstances did not warrant deployment of the actual safety car. It obliged drivers to reduce their speed to match one indicated on the displays on their steering wheels. The safety car procedure was amended as well: once the last lapped car had passed the leader, the safety car returned to the pit lane at the end of the following lap. This was a change of the previous practice which required the unlapped cars to have caught up with the back of the pack before the safety car could return to the pit lane. If a race were suspended (red-flagged), the cars would no longer have lined up on the grid but instead would have slowly proceeded to the pit lane. The pit exit would have been closed and the first car to arrive in the pit lane would have proceeded to the exit with the others lining up behind in the order in which they arrived, regardless of race standing or garage location. Severe circumstances could still have required cars to stop immediately on track. Beginning with the Belgian Grand Prix, radio communication from engineers to drivers pertaining to race starts, such as recommended torque map settings for optimal acceleration, was no longer allowed. This restriction added to the partial radio ban implemented at the end of the previous season. Drivers were also no longer permitted to change the design of their helmet in-season. Max Verstappen (pictured at the Malaysian Grand Prix) set two records in his first two races: youngest driver to start a race, and youngest driver to score points. Before the start of the season, Hamilton announced he would not be exercising his option of switching his car number to 1 for 2015, as was his prerogative as reigning World Champion, and would instead race with his career number 44. It was the first season since 1994, when Alain Prost retired from the sport following his fourth and final World Drivers' Championship title in 1993, that the field did not contain a number 1 car. Following the financial struggles faced by Marussia and Caterham in 2014, the FIA approved the use of 2014-specification chassis in 2015 provided that teams showed cause and received an individual dispensation to compete with their old chassis. A request by Manor Marussia to use their 2014 car was rejected by the other teams. Subsequent regulation changes allowed the team to use a modified 2014 chassis which met updated safety and dimensional limits. The car was powered by a 2014 specification Ferrari power unit, with a new chassis to be introduced later in the season. However, following the twelfth round, Manor Marussia elected to abandon those plans in favour of developing the car for the following season. McLaren's Fernando Alonso was involved in a pre-season testing accident that saw the two-time World Drivers' Champion hospitalised. McLaren claimed the crash was caused by a sudden gust of wind disrupting the car's downforce, while Alonso insisted the crash was caused by his steering wheel locking up. On physicians' advice, Alonso elected to sit out the opening round in Australia, prompting the team to replace him with Kevin Magnussen for the race. Alonso was cleared to race by the second round in Malaysia. 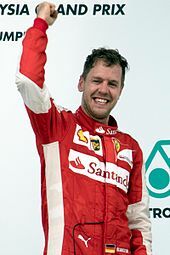 In Malaysia, Sebastian Vettel secured Ferrari's first victory since the 2013 Spanish Grand Prix and his first victory since the 2013 Brazilian Grand Prix. Mercedes began the season with a one–two finish in Australia, resulting in a twenty-eight-point lead after just one round. They finished over thirty seconds clear of Sebastian Vettel, who finished third and secured a podium finish in his first race with Ferrari. Red Bull's Daniel Ricciardo finished a lap down in sixth, prompting the team to continue to voice their frustrations with Renault, as they were forced to use its second of four allotted power units for Ricciardo on the very first day of the season. The team also voiced its displeasure over the progress Renault had made in terms of power, with the team principal, Christian Horner, stating that the Energy F1-2015 was still 100 horsepower (75 kW) down on Mercedes's PU106B Hybrid. After the race, the Red Bull team advisor Helmut Marko suggested that Red Bull might exit Formula One entirely if changes to the regulations were not made to level the field or cut development costs. Renault countered with their own threat to pull out of Formula One as an engine supplier if its reputation continued to be damaged or if its participation was otherwise not profitable to the company. Mercedes followed up by finishing second and third in Malaysia, while Red Bull continued to struggle, rounding out the top ten a lap down. After four rounds, Mercedes led the field, having earned 159 points (with Lewis Hamilton acquiring 93 out of 100 possible points), while Red Bull's struggles continued. The team acquired twenty-six points, enough for a distant fourth, and Ricciardo entered the European stages of the season on his fourth and final permissible power unit with fifteen events remaining on the calendar. With McLaren's longest continuous testing session lasting twelve laps in Barcelona – a total of 56 kilometres (35 mi), a sixth of a total Grand Prix distance – before running into engine trouble, Honda elected to detune the power units for the opening Grands Prix in an effort to improve reliability and longevity while the manufacturer worked to improve these areas before homologation. After both cars qualified on the back row, Kevin Magnussen failed to reach the grid after suffering an abrupt engine failure while on his way from the pit lane to the grid. Jenson Button managed to finish the race, albeit in the last classified position, two laps behind the leaders. Magnussen relinquished his seat back to Alonso in Malaysia; both cars qualified ahead of only the Manor Marussia cars and eventually retired. The team showed signs of improvement in terms of performance and was able to compete with the midfield cars in China and Bahrain, although reliability continued to prove troublesome as Button's car was unable to compete in the latter Grand Prix. Following a tumultuous pre-season in which they went through a period of administration and were saved by late investment, Manor Marussia arrived in Melbourne with a car that had passed its mandatory crash tests but had completed no testing. After the team's arrival in Australia, while assembling the cars, it was discovered that their computers had been wiped completely clean of all data in preparation for auction, and they ultimately could not compete in the Grand Prix. The team managed to get their cars running and on the racetrack by the second round in Malaysia, and were able to set times within 107% of the leading times in practice, giving stewards reasonable grounds to allow the team to race when they failed to do so in qualifying. Merhi was able to finish the race three laps down in fifteenth, while Stevens did not start. Manor Marussia continued to show signs of consistency, with both cars qualifying within 107%, starting, and finishing both Grands Prix in China and Bahrain. They were one of two teams, the other being McLaren, to return to Europe without a championship point. Ferrari came into the season seemingly much more competitive than the previous season, finishing on the podium in the opening race. Kimi Räikkönen stated that the SF15-T was "much better" to drive than 2014's F14 T. In Malaysia, Vettel won comfortably and Räikkönen finished in fourth, despite suffering a tyre failure. The team then finished third and fourth in China and Räikkönen secured his first podium appearance since rejoining Ferrari the previous season with a second-place finish in Bahrain. With 107 points, the team returned to Europe 52 points behind Mercedes, and 46 points ahead of Williams, who were third. Sauber left the opening rounds with their first points since 2013. Nico Rosberg leads the field on the opening lap of the Spanish Grand Prix. He would go on to win the race. Mercedes arrived at Spain already with a comfortable lead. Lewis Hamilton had scored ninety-three points out of a possible one hundred, giving him a twenty-seven-point lead over his teammate Nico Rosberg entering the eight-race European portion of the season. Rosberg quickly cut into Hamilton's championship lead by securing victories in Spain (reducing his deficit to twenty points) and Monaco. The latter win was aided by the result of a costly miscalculation by the Mercedes team to pit Hamilton with a 19-second lead during a safety car period (that briefly saw the use of the "Virtual Safety Car" for the first time in F1's history) with 14 laps remaining. Rosberg and Sebastian Vettel did not make pit stops, allowing both to narrowly pass Hamilton by the pit lane exit. Racing resumed on lap seventy-one and Rosberg quickly pulled away, remaining in the lead till the chequered flag. Vettel held off Hamilton for second and third, respectively. As a result, Hamilton's lead over Rosberg in the Drivers' Championship was cut in half, to just ten points. Meanwhile, Button secured McLaren's first points of the season by finishing eighth. This left the Marussia drivers of Stevens and Merhi, along with the other McLaren driver, Fernando Alonso, as the only full-time drivers not to score a point after seven rounds. Lewis Hamilton (top) gestures to his home crowd following his fifth win of the season at Silverstone, while Fernando Alonso (bottom) picked up his first point of the season. At the following Grands Prix in Canada, Austria, and Britain, Mercedes put to rest the criticism following the result in Monaco through finishing first and second in the next three races, extending their championship lead to 160 points over Ferrari. Williams collected their first two podiums of the season in the form of third-place results by Valtteri Bottas in Canada and Felipe Massa in Austria, while Ferrari lost ground to Mercedes following a retirement in Austria and an eighth-place finish in Britain by Räikkönen. Other power unit manufacturers continued to struggle, with a Renault-powered car finishing in the top five only once, in Monaco, indicating their continued lack of power. Honda continued to have reliability issues and, up to the British Grand Prix, suffered nine retirements and two failures to start due to power unit problems, translating to only seven overall finishes out of 18 possible results. The Drivers' Championship remained closely contested between leader Lewis Hamilton and Nico Rosberg, with the gap between them never larger than twenty-eight points after Hamilton's victory in round eleven in Belgium. The two would trade victories between rounds six and nine, closing the gap to as little as ten points. 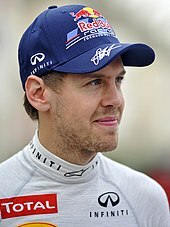 Sebastian Vettel, who at one time was within three points of the lead, after his victory in Malaysia, and who was the only non-Mercedes winner after eleven rounds, could not overcome team errors in Canada and Austria, and fell fifty-nine points off the pace of Hamilton after round nine. He rebounded in Hungary by winning his second race of the season, reducing the gap to Hamilton to forty-two points in the process, but fell out of a point-scoring position in Belgium after a tyre failure on the penultimate lap, dropping him to sixty-seven points behind the leader. Hamilton closed out the European portion of the season with his seventh victory of the season in Italy. With Rosberg's retirement at the event, Hamilton entered the closing rounds of the season with a lead of fifty-three points over his teammate in the Drivers' Championship standings, the largest gap of the season at that point, while Vettel sat a further twenty-one points behind. Hamilton's tenth pole position in Belgium assured him of victory in the FIA Pole Trophy, the award for the driver who achieves the most pole positions during the season. Mercedes had built up a 181-point lead over Ferrari in the Constructors' Championship, with Williams in third, 263 points behind the leaders. After twelve rounds, half of the teams had been represented on the podium, while nine out of ten had scored points. American Alexander Rossi, seen here driving at his home race, made his Formula One race debut at the Singapore Grand Prix. Shortly before the thirteenth round in Singapore, Manor Marussia announced that the American GP2 driver Alexander Rossi would race for the team, replacing Merhi in five of the final seven rounds, while Merhi was retained for the remaining two. Vettel won his third victory of the season in Singapore, closing his gap to Nico Rosberg in second place to just eight points. 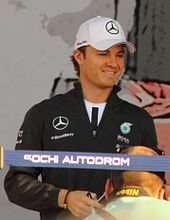 Rosberg could not close the gap to Hamilton in Japan or Russia; despite winning pole position in both races, his leads were short-lived. He was passed by Hamilton on the opening corner in Japan and retired on lap seven in Russia. Vettel capitalised on the results with third and second-place finishes respectively, to take second place in the Drivers' Championship from Rosberg with four rounds remaining, while Hamilton extended his lead to sixty-six points, the highest lead he had held in the season. A victory in the United States, with Rosberg and Vettel finishing second and third respectively, secured the third Drivers' Championship for Hamilton with three races left to run. Rosberg won the final three races in Mexico, Brazil, and Abu Dhabi to reclaim second in the Drivers' Championship from Vettel, while Hamilton secured the Fastest Lap Award in Brazil. Nico Rosberg finished the season ranked second for Mercedes, 59 points behind Hamilton. Lewis Hamilton ended the season winning not only the championship, but also the FIA Pole Trophy for most pole positions of the season and the DHL Fastest Lap Award. Ferrari won the inaugural DHL Pit Stop Award, posting the fastest pit stop time at seven of the first eighteen races of the season. Both Hamilton and Mercedes collected their championship trophies at a gala held in Paris on 4 December 2015. Toro Rosso's Max Verstappen collected three post-season awards for Rookie of the Year, Personality of the Year and Action of the Year (for his overtake on Felipe Nasr through Blanchimont corner at the Belgian Grand Prix). Sauber's early season preparations were disrupted by a series of legal challenges from the former Caterham driver Giedo van der Garde, who claimed that the team had reneged on a contract to race that was signed in June 2014. Van der Garde filed a motion with the Supreme Court of Victoria in Australia in an effort to force the team to replace one of their drivers with him at the opening round in Melbourne, with the court finding in his favour. Van der Garde later agreed not to participate in the event, with the driver and team settling the dispute for an undisclosed sum and terminating the contract following the first round. Lotus suffered financially throughout the season, culminating in Pirelli withholding their tyres for the Friday practice sessions in Hungary. Before the Belgian Grand Prix, amid negotiations with Renault for a potential takeover, the former Lotus reserve driver Charles Pic initiated legal action against Lotus alleging lack of seat time in 2014, resulting in breach of contract. Belgian authorities later moved to impound the assets of Lotus for four days following Grosjean's podium finish. After talks between the FIA and Lotus, the team was allowed to leave Spa with their equipment and cars, and was able to start the following race in Italy. † – The driver did not finish the Grand Prix, but was classified as they completed more than 90% of the race distance. † – Drivers did not finish the Grand Prix, but were classified as they completed more than 90% of the race distance. The standings are sorted by best result, rows are not related to the drivers. ^ a b In the event that two or more drivers or constructors achieved the same best result an equal number of times, their next-best result was used, and so on. If two or more drivers or constructors achieved equal results an equal number of times, the FIA would have nominated the winner according to such criteria as it thought fit. ^ Rothwell, James (26 October 2015). "Lewis Hamilton wins US Grand Prix 2015 and clinches third world title". The Telegraph. Archived from the original on 15 December 2015. Retrieved 26 October 2015. ^ a b "2015 FIA F1 World Championship – Updated Entry List". Fédération Internationale de l'Automobile. 10 March 2015. Archived from the original on 12 March 2015. Retrieved 10 August 2016. ^ a b "SF15-T". Scuderia Ferrari. Retrieved 15 April 2017. ^ "Friday's FIA Press Conference – Great Britain". Formula One World Championship Limited. 3 July 2015. Archived from the original on 5 July 2015. Retrieved 11 September 2016. VM: Well, all of us have been eagerly awaiting the British Grand Prix and the launch of our new B-spec car. ^ Collantine, Keith (12 March 2015). "Manor F1 car appears in Australia". F1 Fanatic. Archived from the original on 15 March 2015. Retrieved 12 March 2015. ^ "Manor Marussia F1 Team partners with Airbnb. Helping race fans around the globe feel at home anywhere". ManorMarussiaF1TeamMedia. 4 June 2015. Archived from the original on 14 July 2015. Retrieved 6 June 2015. ^ "Manor F1 Team on provisional 2015 entry list". ESPN Sport UK. 5 November 2014. Archived from the original on 5 November 2014. Retrieved 5 November 2014. ^ a b Anderson, Ben; Noble, Jonathan (20 February 2015). "Manor F1 team agrees to use 2014 Ferrari engines". Autosport. Haymarket Publications. Archived from the original on 22 February 2015. Retrieved 20 February 2015. ^ "Renault Energy F1-2015: Media Guide" (PDF). Renault. Archived from the original (PDF) on 18 February 2015. Retrieved 29 January 2015. ^ "Mercedes provide early look at 2015 car". Grand Prix 247. Archived from the original on 22 May 2016. Retrieved 29 January 2015. ^ "McLaren". Formula One World Championship Limited. Archived from the original on 15 March 2015. Retrieved 28 February 2015. ^ "2015 Australian Grand Prix – Entry List" (PDF). Fédération Internationale de l'Automobile. 12 March 2015. Archived (PDF) from the original on 12 March 2015. Retrieved 12 March 2015. ^ "Grid overview: Formula 1 teams of 2015". GPUpdate.net. JHED Media BV. 7 March 2015. Archived from the original on 29 October 2015. Retrieved 21 March 2015. ^ "2015 Malaysian Grand Prix – Entry List" (PDF). Fédération Internationale de l'Automobile. 26 March 2015. Archived (PDF) from the original on 26 March 2015. Retrieved 26 March 2015. ^ "2015 Chinese Grand Prix – Entry List" (PDF). Fédération Internationale de l'Automobile. 9 April 2015. Archived (PDF) from the original on 9 April 2015. Retrieved 9 April 2015. ^ "2015 Spanish Grand Prix – Entry List" (PDF). Fédération Internationale de l'Automobile. 7 May 2015. Archived from the original on 8 May 2015. Retrieved 8 May 2015. ^ "2015 Hungarian Grand Prix – Entry List" (PDF). Fédération Internationale de l'Automobile. 23 July 2015. Archived from the original on 23 July 2015. Retrieved 23 July 2015. ^ "2015 Singapore Grand Prix – Entry List" (PDF). Fédération Internationale de l'Automobile. 17 September 2015. Archived from the original on 17 September 2015. Retrieved 17 September 2015. ^ "2015 Japanese Grand Prix – Entry List" (PDF). Fédération Internationale de l'Automobile. 24 September 2015. Archived from the original on 24 September 2015. Retrieved 24 September 2015. ^ "2015 United States Grand Prix – Entry List" (PDF). Fédération Internationale de l'Automobile. 22 October 2015. Archived from the original on 23 October 2015. Retrieved 10 August 2016. ^ "2015 Mexican Grand Prix – Entry List" (PDF). Fédération Internationale de l'Automobile. 29 October 2015. Archived from the original on 23 October 2015. Retrieved 10 August 2016. ^ "2015 Brazilian Grand Prix – Entry List" (PDF). Fédération Internationale de l'Automobile. 12 November 2015. Archived from the original on 13 November 2015. Retrieved 10 August 2016. ^ a b Collantine, Keith (16 May 2013). "Honda confirm F1 return with McLaren in 2015". F1 Fanatic. Archived from the original on 11 April 2016. Retrieved 16 May 2013. ^ Anderson, Ben (9 October 2014). "Lotus confirms Mercedes engine switch". Autosport. Haymarket Publications. Archived from the original on 14 October 2014. Retrieved 9 October 2014. ^ Galloway, James (9 October 2014). "Struggling Lotus seal deal for Mercedes powertrain from 2015 season". Sky Sports. British Sky Broadcasting. Archived from the original on 3 May 2016. Retrieved 10 August 2016. ^ Benson, Andrew (4 February 2015). "Marussia team could make Formula 1 return this season". British Broadcasting Corporation. Archived from the original on 11 March 2015. Retrieved 4 February 2015. ^ "Caterham Formula 1 team's assets put up for sale by administrators". Autosport. Haymarket Publications. Archived from the original on 10 March 2015. Retrieved 5 February 2015. ^ Benson, Andrew (5 February 2015). "Caterham hopes fade as team's remaining assets go up for sale". British Broadcasting Corporation. Archived from the original on 22 July 2015. Retrieved 5 February 2015. ^ "Caterham assets to be auctioned off". GPUpdate.net. JHED Media BV. 5 February 2015. Archived from the original on 11 April 2016. Retrieved 5 February 2015. ^ "McLaren-Honda announces Fernando Alonso and Jenson Button for 2015". McLaren. 11 December 2014. Archived from the original on 12 July 2015. Retrieved 11 December 2014. ^ Galloway, James (11 December 2014). "McLaren retain Jenson Button as partner for returning Fernando Alonso in 2015". Sky Sports. British Sky Broadcasting. Archived from the original on 13 December 2014. Retrieved 12 December 2014. ^ a b Elizalde, Pablo (3 March 2015). "Alonso to miss Australian Grand Prix". Motorsport Network. Archived from the original on 2 April 2015. Retrieved 3 March 2015. ^ "Welcome Sebastian – Vettel and Raikkonen 2015 driver pairing". Ferrari. 20 November 2014. Archived from the original on 8 January 2015. Retrieved 20 November 2014. ^ "New Team Driver Line Up For 2015". Infiniti Red Bull Racing. 4 October 2014. Archived from the original on 12 May 2015. Retrieved 4 October 2014. ^ "Jean-Eric Vergne becomes test driver for the Scuderia". Ferrari.com. 19 December 2014. Archived from the original on 23 January 2015. Retrieved 19 December 2014. ^ Freemann, Glenn (28 November 2014). "Carlos Sainz Jr joins Max Verstappen at Toro Rosso for F1 2015". Autosport. Haymarket Publications. Archived from the original on 9 April 2015. Retrieved 28 November 2014. ^ "Verstappen to race for Toro Rosso in 2015". GPUpdate.net. JHED Media BV. 18 August 2014. Archived from the original on 11 April 2016. Retrieved 18 August 2014. ^ "Sauber F1 team signs ex-Caterham driver Marcus Ericsson for 2015". Autosport. Haymarket Publications. 1 November 2014. Archived from the original on 23 March 2015. Retrieved 1 November 2014. ^ "Sauber F1 Team announces Felipe Nasr as its driver for 2015". Sauber. 5 November 2014. Archived from the original on 19 January 2015. Retrieved 5 November 2014. ^ "Ferrari sign Esteban Gutierrez as test driver". British Broadcasting Corporation. 15 December 2014. Archived from the original on 4 April 2015. Retrieved 15 December 2014. ^ Noble, Jonathan (26 March 2015). "Adrian Sutil becomes Williams Formula 1 reserve driver". Autosport. Haymarket Publications. Archived from the original on 16 April 2016. Retrieved 26 March 2015. ^ "Will Stevens secures Manor Formula 1 race seat". Autosport. Haymarket Publications. 25 February 2015. Archived from the original on 4 March 2015. Retrieved 25 February 2015. ^ Freeman, Glenn (9 March 2015). "Roberto Merhi to race for Manor F1 team in Australian Grand Prix". Autosport. Haymarket Publications. Archived from the original on 14 March 2016. Retrieved 9 March 2015. ^ "Indy Lights – Max Chilton". Indycar.com. 2015. Archived from the original on 22 December 2015. Retrieved 19 August 2015. ^ "Jules Bianchi's promising F1 career ends in tragedy after earlier hopes of joining Ferrari's ranks". abc.net.au. Australian Broadcasting Corporation. 17 July 2015. Archived from the original on 22 May 2016. Retrieved 18 July 2015. ^ "Jules Bianchi's prognosis unclear after F1 crash". Sydney Morning Herald. AFP. 7 October 2014. Archived from the original on 4 February 2016. Retrieved 7 March 2015. ^ Collantine, Keith (7 October 2014). "Bianchi suffered brain injury in crash". F1 Fanatic. Archived from the original on 19 March 2015. Retrieved 7 March 2015. ^ "American racing driver Alexander Rossi to make F1 debut this weekend". Fox Sports Interactive Media. 16 September 2015. Archived from the original on 2 October 2015. Retrieved 16 September 2015. ^ "Kobayashi joins Japanese Super Formula for 2015". ESPN. 31 January 2015. Archived from the original on 9 February 2015. Retrieved 9 February 2015. ^ a b c d e f g h i j k l m n o p "World Motor Sport Council 2014 – Doha". Fédération Internationale de l'Automobile. 3 December 2014. Archived from the original on 19 March 2015. Retrieved 3 December 2014. ^ a b "Germany dropped from 2015 calendar". Formula One World Championship Limited. 20 March 2015. Archived from the original on 9 April 2015. Retrieved 20 March 2015. ^ Noble, Jonathan (23 July 2014). "Mexico to return to Formula 1 calendar in 2015". Autosport. Haymarket Publications. Archived from the original on 6 October 2014. Retrieved 23 July 2014. ^ Collantine, Keith (24 July 2014). "Video reveals planned changes to Mexico's F1 track". F1 Fanatic. Archived from the original on 11 April 2016. Retrieved 24 July 2014. ^ "New Jersey Formula One race shelved until at least 2016". Autoweek.com. Crain Communications. 28 July 2014. Archived from the original on 30 January 2015. Retrieved 17 January 2015. ^ Sylt, Christian (24 December 2013). "New Jersey Grand Prix organizers in breach of contract says Ecclestone". Autoweek.com. Crain Communications. Archived from the original on 29 March 2015. Retrieved 17 January 2015. ^ "Tax issues have to be sorted for Indian GP return: Sameer Gaur". The Times of India. 11 July 2015. Archived from the original on 31 December 2015. Retrieved 27 October 2015. ^ Noble, Jonathan (1 October 2009). "Hockenheim secures Formula 1 future". Autosport. Haymarket Publications. Archived from the original on 6 September 2016. Retrieved 6 September 2016. ^ "German GP at Nürburgring still uncertain". GPUpdate.net. JHED Media BV. 13 January 2015. Archived from the original on 28 April 2016. Retrieved 13 January 2015. ^ "Hockenheim says 'nothing fixed' for 2015". GPUpdate.net. JHED Media BV. 15 January 2015. Archived from the original on 29 October 2015. Retrieved 15 January 2015. ^ Galloway, James (21 January 2015). "Bernie Ecclestone says German GP not certain to take place in 2015". Sky Sports. British Sky Broadcasting. Archived from the original on 21 March 2015. Retrieved 22 January 2015. ^ "Hockenheim rules out hosting German GP". GP Update.net. JHED Media BV. 17 March 2015. Archived from the original on 11 April 2016. Retrieved 20 March 2015. ^ "Nürburgring will not stage German GP". GPUpdate.net. JHED Media BV. 19 March 2015. Archived from the original on 3 April 2015. Retrieved 20 March 2015. ^ Benson, Andrew (6 January 2015). "Korea dropped from 2015 calendar". British Broadcasting Corporation. Archived from the original on 6 April 2015. Retrieved 6 January 2015. ^ Collins, Sam (5 March 2013). "Renault RS34 – the future of Formula 1". Racecar Engineering. Chelsea Magazines Ltd. Archived from the original on 11 April 2016. Retrieved 1 May 2013. ^ a b "World Motor Sport Council 2015 – Mexico". Fédération Internationale de l'Automobile. 10 July 2015. Archived from the original on 11 July 2015. Retrieved 10 July 2015. ^ Saward, Joe (8 July 2014). "Changing the F1 engines of today". joeblogsf1. WordPress. Archived from the original on 12 July 2014. Retrieved 9 July 2014. ^ Noble, Jonathan; Scarborough, Craig (20 June 2014). "Formula 1 chiefs move to avoid ugly noses in 2015". Autosport. Haymarket Publications. Archived from the original on 2 January 2015. Retrieved 21 June 2014. ^ a b Collantine, Keith (8 March 2015). "The new F1 rules for 2015 at a glance". F1Fanatic. Archived from the original on 10 July 2016. Retrieved 10 July 2016. ^ "Bahrain Grand Prix: Why sparks can make F1 great again". British Broadcasting Corporation. 19 April 2015. Archived from the original on 23 April 2015. Retrieved 4 October 2015. ^ "Formula 1 races to start early after Jules Bianchi crash". British Broadcasting Corporation. 20 January 2015. Archived from the original on 14 October 2015. Retrieved 20 January 2015. ^ "Lewis Hamilton fears starts will be made even worse by F1 rule change". Telegraph. Archived from the original on 8 December 2015. Retrieved 18 August 2015. ^ Noble, Jonathan (18 February 2015). "F1 helmet design changes in-season to be banned". Autosport. Haymarket Publications. Archived from the original on 21 March 2015. Retrieved 18 February 2015. ^ Benson, Andrew (23 November 2014). "Lewis Hamilton wins world championship in Abu Dhabi". British Broadcasting Corporation. Archived from the original on 26 October 2015. Retrieved 23 November 2014. ^ Allen, James (12 October 2014). "Hamilton wins, Rosberg errs, Mercedes clinch constructors' title in Sochi". James Allen on F1. Archived from the original on 17 October 2014. Retrieved 14 October 2014. ^ Collantine, Keith (25 November 2014). "Hamilton won't have number one on his car in 2015". F1 Fanatic. Archived from the original on 3 March 2015. Retrieved 31 May 2015. ^ Allen, James (13 December 2014). ""Never give up": Caterham and former Marussia F1 teams still hoping for F1 reprieve". James Allen on F1. Archived from the original on 11 April 2016. Retrieved 14 December 2014. ^ "Marussia comeback blocked by Force India no vote". British Broadcasting Corporation. 5 February 2015. Archived from the original on 8 February 2015. Retrieved 6 February 2015. ^ "Marussia future under threat as rival teams turn down 2014 car use request". Sky Sports. British Sky Broadcasting. 6 February 2015. Archived from the original on 29 March 2015. Retrieved 14 February 2015. ^ Baretto, Lawrence (11 September 2015). "Manor F1 team set to delay new car introduction to 2016". Autosport. Haymarket Publications. Archived from the original on 24 October 2015. Retrieved 12 September 2015. ^ "Fernando Alonso says locked steering caused Barcelona crash". Sky Sports. British Sky Broadcasting. 28 March 2015. Archived from the original on 27 March 2015. Retrieved 4 April 2015. ^ "McLaren: wind to blame for Alonso crash". Formula One World Championship Limited. 23 February 2015. Archived from the original on 22 May 2016. Retrieved 6 March 2015. ^ "Alonso, Bottas cleared to race in Malaysia". Fox Sports Interactive Media. 26 March 2015. Archived from the original on 27 March 2015. Retrieved 4 April 2015. ^ a b c Barretto, Lawrence (15 March 2015). "Australian GP: Lewis Hamilton beats Nico Rosberg to win". Autosport. Haymarket Publications. Archived from the original on 12 July 2016. Retrieved 10 August 2016. ^ a b "Race". Formula One World Championship Limited. 15 March 2015. Archived from the original on 16 March 2015. Retrieved 10 August 2016. ^ Straw, Edd; Beer, Matt (13 March 2015). "Daniel Ricciardo already onto second F1 engine". Autosport. Haymarket Publications. Archived from the original on 15 March 2015. Retrieved 10 August 2016. ^ "Horner says Renault 100hp behind Mercedes". GPUpdate.net. JHED Media BV. 15 March 2015. Archived from the original on 29 October 2015. Retrieved 10 August 2016. ^ "Red Bull issues quit threat over F1 regulations". ESPN F1. 15 March 2015. Archived from the original on 8 April 2015. Retrieved 10 August 2016. ^ "Renault threatens to quit Formula One as engine stoush continues". Reuters. ABC Online. 27 March 2015. Archived from the original on 29 March 2015. Retrieved 10 August 2016. ^ a b c Barretto, Lawrence (29 March 2015). "F1 Malaysian GP: Sebastian Vettel and Ferrari defeat Mercedes". Autosport. Haymarket Publications. Archived from the original on 12 July 2016. Retrieved 10 August 2016. ^ "2015 Driver Standings". Formula One World Championship Limited. Archived from the original on 21 April 2015. Retrieved 10 August 2016. ^ "Horner: No short-term fixes for Red Bull". GPUpdate.net. JHED Media BV. 23 April 2015. Archived from the original on 11 July 2015. Retrieved 10 August 2016. ^ "2015 Constructor Standings". Formula One World Championship Limited. Archived from the original on 21 April 2015. Retrieved 10 August 2016. ^ Straw, Edd; Rencken, Dieter (19 April 2015). "Daniel Ricciardo onto his fourth F1 engine after Bahrain GP failure". Autosport. Haymarket Publications. Archived from the original on 21 May 2016. Retrieved 10 August 2016. ^ "Australian GP: Honda detunes McLaren's F1 engine for reliability". Autosport. Haymarket Publications. 14 March 2015. Archived from the original on 15 March 2015. Retrieved 10 August 2016. ^ "Points don't matter to McLaren – Button". GPUpdate.net. JHED Media BV. 15 March 2015. Archived from the original on 20 September 2015. Retrieved 10 August 2016. ^ Collantine, Keith (26 March 2015). "Alonso's race return confirmed by FIA". F1Fanatic. Archived from the original on 28 March 2015. Retrieved 10 August 2016. ^ Benson, Andrew (28 March 2015). "Lewis Hamilton on Malaysian GP pole after torrential rain". British Broadcasting Corporation. Archived from the original on 28 March 2015. Retrieved 10 August 2016. ^ Weaver, Paul (29 March 2015). "Sebastian Vettel wins F1's Malaysia GP to leave Lewis Hamilton frustrated". The Guardian. Archived from the original on 22 May 2016. Retrieved 10 August 2016. ^ "2015 Bahrain Grand Prix Race Report". McLaren. 19 April 2015. Archived from the original on 22 May 2016. Retrieved 10 August 2016. ^ Benson, Andrew (4 February 2015). "Marussia team could make Formula 1 return this season". British Broadcasting Corporation. Archived from the original on 16 March 2015. Retrieved 10 August 2016. ^ "FIA miffed over Manor Marussia F1 team's absence in Australia". Autoweek. Crain Communications. GMM. 14 March 2015. Archived from the original on 16 March 2015. Retrieved 10 August 2016. ^ Rose, Gary (14 March 2015). "Australian Grand Prix qualifying – As it happened". British Broadcasting Corporation. Archived from the original on 13 March 2015. Retrieved 10 August 2016. ^ "Marussia drivers granted permission to start in Malaysia". Formula One World Championship Limited. 28 March 2015. Archived from the original on 30 March 2015. Retrieved 10 August 2016. ^ "Manor Marussia 'proud' of flyaway efforts". GPUpdate.net. JHED Media BV. 20 April 2015. Archived from the original on 12 July 2016. Retrieved 10 August 2016. ^ a b c Barretto, Lawrence (19 April 2015). "F1 Bahrain GP: Lewis Hamilton wins ahead of Kimi Raikkonen". Autosport. Haymarket Publications. Archived from the original on 12 July 2016. Retrieved 10 August 2016. ^ "Raikkonen: SF15-T gives Ferrari 'something to work with'". en.espn.co.uk. ESPN. 4 February 2015. Archived from the original on 3 August 2016. Retrieved 10 August 2016. ^ Galloway, James (15 October 2015). "Chinese GP: Hamilton wins again ahead of Rosberg and Vettel". Sky Sports. British Sky Broadcasting. Archived from the original on 12 July 2016. Retrieved 10 August 2016. ^ Straw, Edd (16 March 2015). "Sauber: Australian GP points a relief after van der Garde court row". Autosport. Haymarket Publications. Archived from the original on 4 June 2016. Retrieved 10 August 2016. ^ "2015 Driver Standings". Formula One World Championship Limited. Archived from the original on 21 April 2015. Retrieved 9 July 2016. ^ a b Johnson, Daniel (24 May 2015). "Monaco Grand Prix 2015: Lewis Hamilton's dream victory shattered by Mercedes' strategy blunder". Daily Telegraph. Archived from the original on 26 May 2015. Retrieved 26 May 2015. ^ Galloway, James (25 May 2015). "Monaco GP: Nico Rosberg wins after Mercedes 'mistake' denies Hamilton". Sky Sports. British Sky Broadcasting. Archived from the original on 25 May 2015. Retrieved 18 June 2015. ^ Mitchell, Scott (25 May 2015). "Jenson Button proud of first McLaren 2015 F1 points in Monaco GP". Autosport. Haymarket Publications. Archived from the original on 25 May 2015. Retrieved 10 August 2016. ^ "2015 Driver Standings". Formula One World Championship Limited. Archived from the original on 25 May 2015. Retrieved 18 June 2015. ^ a b "Hamilton beats Rosberg to victory in Canada". Formula One World Championship Limited. 7 June 2015. Archived from the original on 9 June 2015. Retrieved 9 July 2016. ^ a b Barretto, Lawrence (21 June 2015). "Austrian GP: Nico Rosberg beats Lewis Hamilton to F1 victory". Autosport. Haymarket Publications. Archived from the original on 9 July 2016. Retrieved 9 July 2016. ^ a b Benson, Andrew (5 July 2015). "Lewis Hamilton wins British GP brilliantly after late rain". British Broadcasting Corporation. Archived from the original on 6 July 2015. Retrieved 5 July 2015. ^ "Toto Wolff Q&A: Montreal proved we're no idiots". Formula One World Championship Limited. 7 June 2015. Archived from the original on 9 June 2015. Retrieved 9 June 2015. Q: Do you feel that the race result restored the balance of the team after the Monaco incident? TW: I must say that after Monaco it was very difficult for the team to handle that situation after the massive media hype. We were exposed to massive criticism. It looked as if all the previous race wins and both title wins of 2014 were suddenly forgotten and a bunch of idiots were managing the team. Today's result makes that all a thing of the past. ^ Anderson, Ben; Adam, Mitchell (15 July 2015). "Daniel Ricciardo says Renault's F1 woes are hurting Red Bull set-up". Autosport. Haymarket Publications. Archived from the original on 18 July 2015. Retrieved 9 July 2016. ^ "McLaren-Honda Formula One marriage is an embarrassment". Autoweek. Crain Communications. 17 June 2016. Archived from the original on 20 June 2015. Retrieved 9 July 2016. ^ Richards, Giles (5 July 2015). "British Grand Prix: once mighty McLaren appear to have lowered F1 sights". The Guardian. Archived from the original on 7 July 2015. Retrieved 9 July 2016. ^ Kalinauckas, Alex (23 August 2015). "Belgian Grand Prix: Lewis Hamilton dominates to take sixth win of the season". James Allen on F1. Archived from the original on 24 August 2015. Retrieved 9 July 2016. ^ "2015 Driver Standings". Formula One World Championship Limited. Archived from the original on 7 July 2015. Retrieved 9 July 2016. ^ Richards, Giles (26 July 2015). "F1: Sebastian Vettel capitalises on poor Mercedes start to win in Hungary". The Guardian. Archived from the original on 7 August 2015. Retrieved 27 July 2015. ^ Richards, Giles (23 August 2015). "Ferrari's Sebastian Vettel unhappy with Pirelli after tyre explosion". The Guardian. Archived from the original on 24 August 2015. Retrieved 24 August 2015. ^ "2015 Driver Standings". Formula One World Championship Limited. Archived from the original on 27 August 2015. Retrieved 9 July 2016. ^ Weaver, Paul (6 September 2016). "F1: Lewis Hamilton hails 'best weekend' after cruising to victory at Monza". The Guardian. Archived from the original on 24 October 2015. Retrieved 9 July 2016. ^ "2015 Driver Standings". Formula One World Championship Limited. Archived from the original on 7 September 2015. Retrieved 10 August 2016. ^ "Hamilton not excited to secure pole trophy". grandprix.com. 28 August 2015. Archived from the original on 9 July 2016. Retrieved 9 July 2016. ^ a b "2015 Constructor Standings". Formula One World Championship Limited. Archived from the original on 12 September 2015. Retrieved 9 July 2016. ^ "F1 2015 Calendar". ESPN. Archived from the original on 9 July 2016. Retrieved 9 July 2016. ^ Noble, Jonathan (16 September 2015). "Rossi to make F1 race debut with Manor in Singapore". Motorsport Network. Archived from the original on 18 September 2015. Retrieved 16 September 2015. ^ Weaver, Paul (20 September 2015). "F1: Sebastian Vettel wins in Singapore but intruder walks on track in race". The Guardian. Archived from the original on 21 May 2016. Retrieved 21 May 2016. ^ a b Benson, Andrew (27 September 2015). "Japan GP: Lewis Hamilton wins to match Ayrton Senna mark". British Broadcasting Corporation. Archived from the original on 30 September 2015. Retrieved 4 October 2015. ^ a b Benson, Andrew (11 October 2015). "Lewis Hamilton wins incident-packed Russian Grand Prix". British Broadcasting Corporation. Archived from the original on 25 October 2015. Retrieved 25 October 2015. ^ "2015 Driver Standings". Formula One World Championship Limited. Archived from the original on 15 October 2015. Retrieved 1 November 2015. ^ Weaver, Paul (25 October 2015). "Lewis Hamilton wins third F1 world title with victory at US Grand Prix". The Guardian. Archived from the original on 26 October 2015. Retrieved 25 October 2015. ^ Bull, JJ (1 November 2015). "Nico Rosberg wins...at last!". The Telegraph. Archived from the original on 2 November 2015. Retrieved 2 November 2015. ^ Johnson, Daniel (15 November 2015). "Lewis Hamilton fails to emulate hero Ayrton Senna as Nico Rosberg triumphs at Brazilian Grand Prix". The Telegraph. Archived from the original on 19 November 2015. Retrieved 19 November 2015. ^ Weaver, Paul (29 November 2015). "Nico Rosberg takes third straight win with victory in Abu Dhabi GP". The Guardian. Archived from the original on 21 April 2016. Retrieved 21 May 2016. ^ "DHL Fastest Lap Award: 2015 Formula 1 Grande Premio Petrobras Do Brasil". DHL in motion. DHL International. 16 November 2015. Archived from the original on 14 February 2016. Retrieved 30 October 2016. ^ "Lewis Hamilton: I'm not excited by winning pole trophies". Eurosport. 29 August 2015. Archived from the original on 3 December 2015. Retrieved 3 December 2015. ^ "Hamilton and Ferrari pick up DHL Fastest Lap and Pit Stop Awards". Formula One World Championship Limited. 29 November 2015. Archived from the original on 3 December 2015. Retrieved 3 December 2015. ^ Galloway, James (5 December 2015). "Lewis Hamilton & Mercedes officially crowned 2015 world champions". Sky Sports. British Sky Broadcasting. Archived from the original on 5 December 2015. Retrieved 5 December 2015. ^ "Sauber confirms van der Garde lawsuit". GPUpdate.net. JHED Media BV. 5 March 2015. Archived from the original on 28 April 2016. Retrieved 6 March 2015. ^ Murphy, Padraic (5 March 2015). "Australian Formula One Grand Prix: driver Giedo van der Garde demands start". Herald Sun. The Herald and Weekly Times. Archived from the original on 6 December 2015. Retrieved 5 March 2015. ^ Collantine, Keith (10 March 2015). "Sauber will not risk safety after van der Garde ruling". F1 Fanatic. Archived from the original on 13 March 2015. Retrieved 10 March 2015. ^ "Van der Garde settles dispute with Sauber". Reuters. 18 March 2015. Archived from the original on 8 April 2015. Retrieved 4 April 2015. ^ Baldwin, Alan (2 September 2015). "Lotus head for Monza hoping for good news". Reuters. Thomson Reuters. Archived from the original on 4 February 2016. Retrieved 6 September 2015. ^ Gill, Pete (27 August 2015). "Lotus cars allowed to leave Spa". Sky Sports. British Sky Broadcasting. Archived from the original on 4 April 2016. Retrieved 21 May 2016. ^ "Lotus startet trotz Rechtsstreits" (in German). Sport1. 1 September 2015. Archived from the original on 21 May 2016. Retrieved 21 May 2016. ^ "2015 Race Results". Formula One World Championship Limited. Archived from the original on 18 November 2016. Retrieved 19 October 2016. ^ "2015 Season Overview". Sky Sports. British Sky Broadcasting. Archived from the original on 24 March 2016. Retrieved 19 October 2016. ^ "2015 DHL Fastest Lap Award". Formula One World Championship Limited. Archived from the original on 19 October 2016. Retrieved 19 October 2016. ^ a b "2015 Formula one Sporting Regulations". Fédération Internationale de l'Automobile. 10 July 2015. Archived from the original on 4 March 2016. Retrieved 29 August 2015. ^ "2015 Formula One season – Drivers' Championship" (PDF). Fédération Internationale de l'Automobile. Archived from the original on 2 December 2015. Retrieved 19 October 2016. ^ "2015 Formula One season – Constructors' Championship" (PDF). Fédération Internationale de l'Automobile. Archived from the original on 2 December 2015. Retrieved 19 October 2016. Wikimedia Commons has media related to 2015 in Formula One. This page was last edited on 10 April 2019, at 11:28 (UTC).